Vanguard is an american company that is registered as investment adviser. Vanguard is know for it's mutual and index funds. Vanguard is the second provider of ETF funds (Exchange Traded Funds). The founder of Vanguard, John C. Bogle, was the creator of the first index fund. Over the years, Vanguard has earned a lot of credibility among investors, because of it's low cost and diversified offer of mutual funds. Vanguard launched the first Index Fund for individual investors in 1976. Today, Vanguard offers more than 60 Index Funds that track several markets, including US and international stocks and bond markets, as well as sector specific index funds. Vanguard also offers index funds. Index funds are mutual funds that mimic the performance of a market index, like the S&P 500 or the DJI. Index Funds are a form of passive investment. Active investment consist in picking stocks or bonds to try to beat the market. Active investment assumes that market failures can be exploited to archive a larger performance. Active investment has a higher cost than passive investment, because it requires research. That is why active managed funds have much larger expenses than index funds. Index Funds allows individuals to invest in the stock markets, diversifying it's investment and not incurring in high costs. Index funds could help reduce long-term costs of investment. Investor shares: slightly higher expenses but low minimum investment. Admiral shares: have lower expenses but higher minimum investment. ETFs: can be more tax efficient, but may incur in brokerage commissions and spread costs. 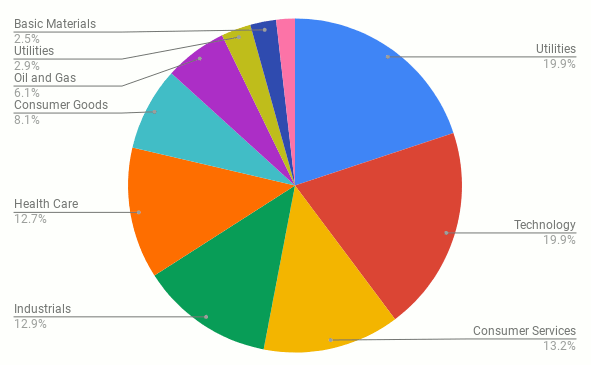 As you can see, this fund is very diversified. This companies are investment grade companies, with stable financials. If you invest less than \$10,000 in a Standard & Poors 500 Index from Vanguard, it will cost you \$20 per year as a service fee. The ETF doesn't have such a fee and might be better for tax purposes. The ETF can be traded in the market, but if you trade it using an account different from Vanguards, there might be a brokerage trading fee and spread costs. If you are willing to invest more than \$10,000 in the S&P 500 fund, the Admiral Class is the better alternative, because you don't have to pay the \$20 fee and the expense ratio is 0.04%. The Vanguard Total Stock Market Index Fund tracks the performance of the CRSP US Total Market Index. This index consist of 4,000 US small, mid and large cap stocks. It is designed to provide exposure to the entire stock market. The main difference between the S&P 500 fund and the Total Stock Market fund is that the S&P 500 doesn't include small cap companies and some medium cap companies. 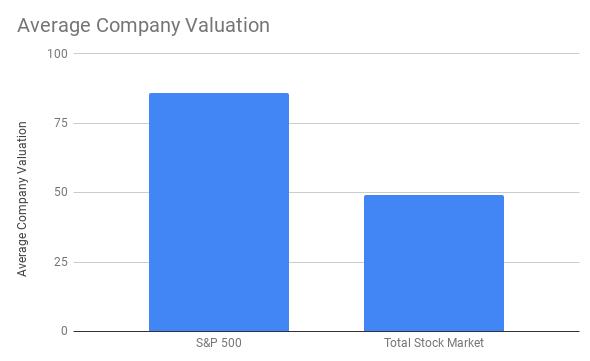 The average company valuation of the S&P 500 index is $86 billion, whereas the average company valuation of the Total Stock Market index is $49 billion. As you can see, the Total Stock Market index has a different composition than the S&P 500. Financials has more weight in the total stock market, whereas IT and Health Care has more weight in the S&P 500. When choosing between the Vanguard Total Stock Market index fund and the Vanguard S&P 500 index fund, we have to take into account the exposure and the difference in returns. Both options have shown very similar performance over the past years. Both Vanguard index funds seem a reasonable approach to the U.S. equity market. Investors willing to add more small cap companies into their portfolio, should consider the Vanguard Total Market index fund. This fund tracks the FTSE Global All Cap ex US Index. The is an index that covers the equity market performance of companies located in developed and emerging markets. It doesn't include companies located in the United States. The index consist of 5350 large, mid and small cap companies in 46 markets worldwide. Companies are weighted by it's market capitalization. 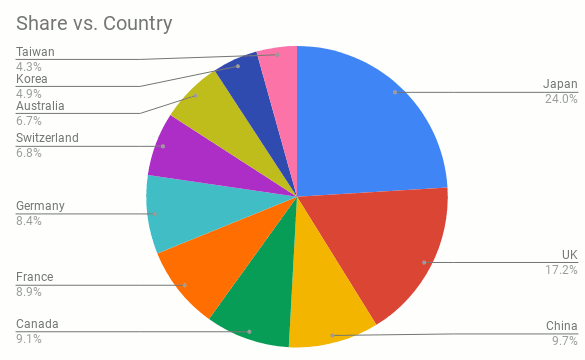 As you can see, this index fund covers a lot of big stocks in many countries. It can be considered more diversified than the Vanguard S&P500 index fund and the Vanguard Total Stock Market Fund. The average market capitalization is $23 billion. This Vanguard fund has an low 0.18 percent expense ratio, and requires a minimum investment of $3,000 for the Investors Shares version (0.17% expense ratio), and $10,000 for the Admiral class (0.11% expense ratio). It also has an ETF version, that also has 0.11% expense ratio, but may incur in brokerage commissions. The non ETF versions are less tax efficient and have more restrictions on buying and selling, but they do not incur in commissions or spreads. This index fund, allows investors to expose it's portfolio to overseas companies. The fund is very diversified by companies, sector and countries. Because it's a market cap weighted fund, it's focused on the largest companies in the world. iShares Core MSCI Total International Stock ETF (IXUS). iShares MSCI ACWI ex-U.S. ETF (ACWX). SPDR MSCI ACWI ex-U.S. ETF (CWI).